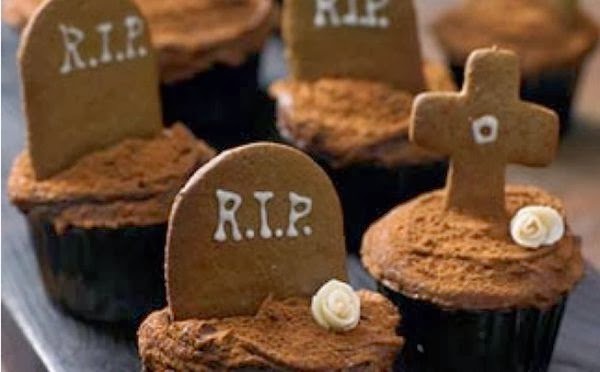 Celebrate Halloween with the latest, creepy and spooky Halloween ideas of cupcakes and decorations to make your Halloween party full of excitement. Halloween celebration countdown has begun and you might have started your preparation for it. Halloween is an abbreviation of All Hallows Even or it is a day before all Hallows day that is also known as All Saints Day begins. It is a catholic holiday and we buy or prepare scariest costume for Halloween theme party and many unique and delicious dishes for our loved ones on this day. We also decorate our home with scary decorating items such as scary lightening with carved pumpkin. Check out Halloween cupcake recipes and different ideas to make your Halloween party scariest and enjoyable. Cupcakes: 155g caster sugar, 60g unsalted butter, 1 large egg, ½ tsp vanilla extract, ¼ tsp salt, 105g plain flour, 25g cocoa powder, ¼ tsp baking soda, 95g sour cream, ¼ cup cooled strong espresso, ½ tsp fresh ground coffee, 4 squares dark chocolate chopped or broken into small chips. Turn on oven for pre-heating. Mix all the dry ingredients flour, cocoa, baking soda, salt in one bowl and keep on side. Now mix butter and sugar with the help of mixer to get light and fluffy mixture. Add egg and vanilla extract into the butter mixture and mix all the ingredients well. Mix dry mixture in three parts by altering with the sour cream. Add cooled coffee and espresso powder and mix well. Finally add chocolate chips and mix it. Fill the batter in cups up to 3/4th and place them on baking pan. Put pan on center of frame and back for 20 minutes. Check center of cake has backed or not with the help of toothpick. Leave cupcakes on room temperature to get cool down. With the help of double boiler, melt the chocolate. Mix sugar and little salt in melted chocolate and mix vigorously. Add soured cream, ¼ lemon juice and stir it continuously. Add cream into the chocolate before chocolate become solid. Put the mixture on side. Crush 80 gm chocolate into the dark chocolate and melt it into the double boiler. With the help of paint brush, spread coating of melted chocolate on each side of tin. Make sure that you do not leave any cracks. Put them in fridge to get cooled. Apply melted chocolate on other side and leave it in the fridge to get solid shape. Remove horns from the tin moulds then store in fridge. 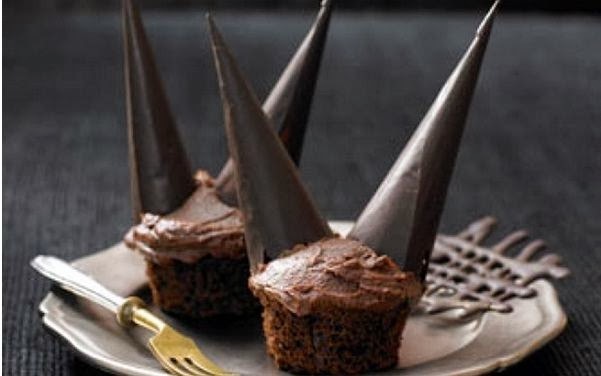 Decoration: Before some minutes of serving, garnish your cup cake with the ganache frosting and two chocolate horns to make your Halloween party chocolaty plus scary. Gingerbread: 3 cups all-purpose flour, 1 tsp baking soda, 2 tsp ground ginger, 11/2 tsp ground cinnamon, 1tsp freshly grated nutmeg, 1/4 tsp salt, 1/2 cup unsalted butter, 1/2 cup (100g) granulated sugar, 2/3 cup (160ml) black treacle, 1 large egg, zest of 1/2 lemon, white icing pen. Preheat oven at 180°C and put 12-hole muffin pan with paper cases. Mix butter and sugar to prepare fluffy mixture. Add egg and vanilla extract and mix vigorously. Mix flour, cocoa, baking soda, and salt in other mixing bowl. Mix dry mixture in three parts by altering with the sour cream. Add cooled coffee to prepare fluffy batter. Now fill the paper cases to the ¾ and let them cook in oven for 15-20 minutes. Allow baked cupcake to get cool down for sometime to decorate them. Mix butter and cocoa vigorously to combine them well. Mix salt, vanilla extract, sugar, and milk slowly in cream by whisking continuously. Mix flour, baking soda, spices, and salt and leave it on side. In other bowl, mix butter and sugar to get fluffy mixture. Add egg, treacle, lemon zest, flour and beat mixture until all the ingredients get mix well. Divide mixture in two parts and wrap every part with plastic and put it into the fridge for three hours. Preheat oven at 180°C and take out the dough from the fridge. Roll out the dough to get the thickness of 1⁄4 inch. Now with the help of cutter or sharp knife, cut the tombstone shapes. 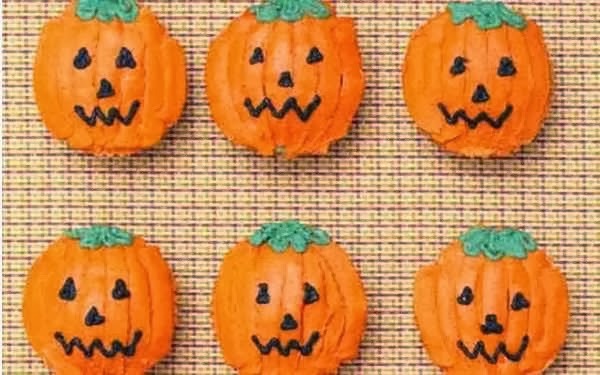 Put tombstone shape cookies into the baking sheet and cook for 6 to 7 minutes as per the small or medium size. With the help of icing pen, write text you want on tombstones cookies. Decoration: Decorate whole cupcake with the help of chocolate frosting cover and dust it by cocoa soil. Place iced gingerbread ‘tombstones’ to complete the decoration. Mix spices, baking powder, soda and salt in big bowl and beat it. In another bowl; beat sugar, pumpkin, eggs, oil and maple syrup. Now slowly fold sugar mixture in flour mixture to make fluffy batter. Now fill the paper cases till the ¾ and put it in oven to bake for 18-19 minutes. Once cakes get baked, put it in room temperature to get ready for decoration. Mix butter, cream cheese to make smooth mixture by vigorous beating. Slowly add icing sugar till cream become light and fluffy. Now mix vanilla extract and whisk it. Put 2 scoop of frosting in one bowl and add dark green food color. In other bowl, take one scoop of frosting and color it with black color. Add orange color in remaining frosting. Decoration: With the help of different colored frosting, make pumpkin face on each cupcake. Trick-or-Treat Sign: With the help of foam core, orange color and black wires and some letters in spooky way; make door sign to give spooky appearance to your door. Entryway Invaders: Choose one place of your home in such a way that every person who enters in your home can directly notice that wall or pillar. Now choose paper or foam core bat cutouts and stagger and place them on that wall or pillar in a formation that it looks like they are coming out from wall or pillar. 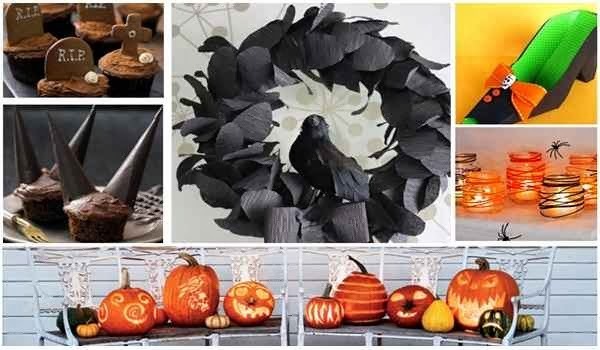 Witches Afoot: It is really spooky and thrilled idea to decorate your home. You can use spooky witches afoot to decorate your home or to place candies in it. Pumpkin Garland: Make a long string of perky pumpkins from orange thin paper and put small bulbs in it. Place it on entrance of your house or at fence around your home to give a really Halloween appearance not only inside but also outside your house. Pumpkin Lanterns: Carve pumpkin in spooky way and put it near to your door with Halloween based decoration and bulb in pumpkin to decorate your home for Halloween. Food Fright: Decorate your dining table with the spooky fingers made from pretzel rods dunked in white chocolate, eyeball donuts, and creepy red velvet cake to give Halloween touch to your dinning table. Haunted House: If you have any old doll house, then convert it into the horrifying haunted house to decorate your home at Halloween. Googly-Eyed Spiders: Convert your waste plastic bottle to make googly eyed spiders. Cut your bottle in such a way that bottom of your bottle make long creepy legs of spider and cap area becomes face of spiders. Spray black color, and hang them in your home for Halloween party with the strings. Halloween Pumpkin Photo Frame Craft: Get your snap in spooky way with big or small sized pumpkin and on Halloween, paste that pic on same pumpkin with the help of glue to give spooky touch in your house. Tangled Web Candles: Take wide mouth waste glass jar and wrap it with black or orange wire. At night, put candle in jar and some toy spiders to give perfect Halloween get up to your home. Witch Craft: Prepare a dramatic sketch of witch flying on her broomstick on foam core, and cut it. Now color it totally black, then spread little glitter on it. Place it on your door to decorate your door in bewitching way. Wicked Window: Put old table or chair near to your house window with lots of candles, and decorate your window with the creepiness of cobwebs and flying bats. Creepy Crawlers: Take small pumpkins and scooped out them. Now put candle in scooped part and creepy spider look by placing pipe cleaners as legs of spider. You can put these lightening creepy spiders on dinning table or near to your window.